Truancy ticketing in LA Unified dropped by nearly 80 percent between 2010 and 2012, and citations across all categories are down by half for the same period. 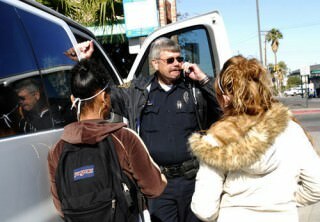 So far this year, district officials report LA school police have issued 77 citations. In contrast, school police were issuing an average of 110 tickets a month in 2010. That’s a significant reduction for the district, which has the largest school police force in the country, and just last year had the distinction of issuing more citations to students than any other in the nation. The district attributes this steady decline to a new truancy policy that is more proactive rather than reactive. But a new report by the Community Rights Campaign contends that minority students continue to receive a higher concentration of citations, most of which are issued for “disturbing the peace,” a catch-all for fighting, smoking and drinking and tagging. The two-year study found high ticketing patterns in South LA, Boyle Heights and San Fernando Valley, where the majority of students are Latino and African American. Manuel Criollo, an organizer with Community Rights Campaign, told LA School Report that his organization applauds the reduction in truancy citations. But he insisted that the district has more to do to ensure that reductions are permanent and to stem citations for other reasons, which are not mentioned in the press release. “What we think this example shows us is that when there are formal protocols, we can begin to reverse the culture that has existed for a long time in LAUSD,” Criollo said. Criollo credits a collaboration between of members of the community and district leadership with fewer citations. And the school board’s adoption in May of the “School Climate Bill of Rights,” banning out-of-school “willful defiance” suspensions. The Community Rights Campaign’s recently released report and executive summary on structural proposals to end the school-to-prison pipeline is available here. Chase Niesner contributed to this report. Previous Posts: Dignity in Schools Campaign: Week of Action Against School ‘Pushout’; LAUSD Proposal Includes Truancy in School Ratings; Truancy Series Wins National Journalism Award.